It was a hot and humid day in Florida -- that's how all my blog posts should start, right? Well, last Wednesday was no exception. I usually dedicate one day each week to my kids so they can each have my full, undivided attention. One of the greatest things about living in Orlando is the unlimited entertainment options, making these one-on-one days attainable and so much fun! My son and I love to ride the big roller coasters. 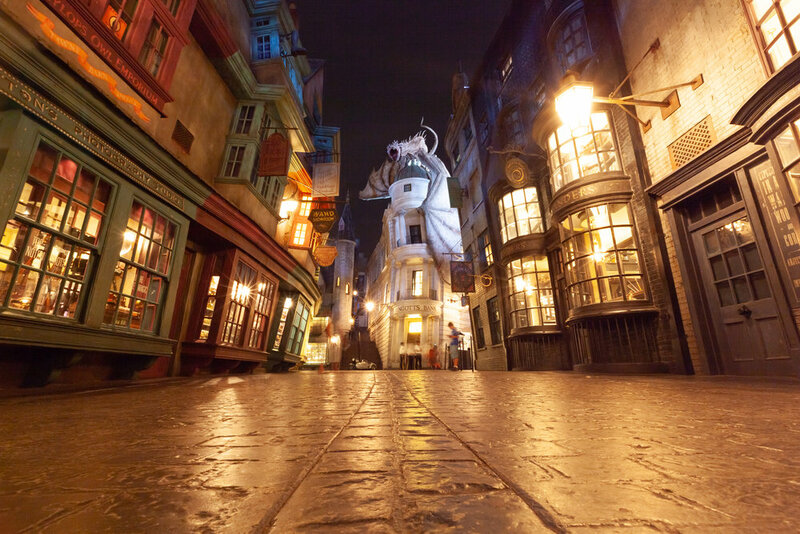 On this day, we chose to spend the day at Universal Studios and Universal's Islands of Adventure. We rode the Incredible Hulk Coaster several times; later, I screamed like a little girl while my son laughed at me on my least favorite ride -- Doctor Doom's Fearfall. 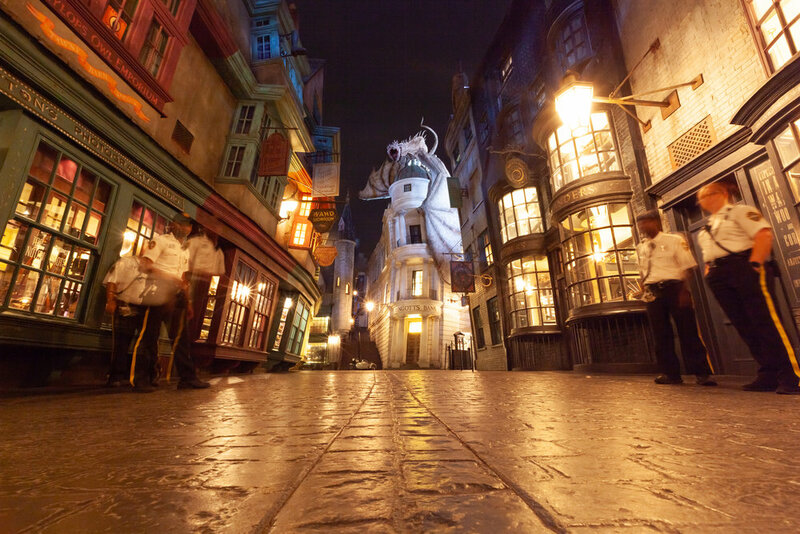 We had lots of fun, and as usual, I had my camera gear with me and a goal in mind; I wanted to get a shot of the Wizarding World of Harry Potter's Diagon Alley at closing time with NO PEOPLE IN THE FRAME. The park was packed -- no surprise; it's summer time in Florida, and I knew I would have to be patient. We scheduled our day so that Harry Potter and the Escape from Gringotts would be our last ride of the day, putting us in the right place at the right time for the picture I had in mind. We sat (more like laid!) on a bench for a while, waiting for people to leave, but nobody was moving! So, I decided to go and set my trusty Canon 5D Mark II with my 16-35mm 2.8 lens on my Platypod Ultra and frame my shot. I started taking pictures just in case I might run out of time and need different images to clone people out in Photoshop. As I was waiting patiently to get the right picture, absent of people in it, I saw a couple security guards asking people to leave. Ugh! All I could think about was getting my shot, which I had been picturing in my head for days. As they came closer to where I was standing, I politely asked them if I could take a quick picture; they agreed, but told me to hurry. The guards stood at the side and waited for me to snap a quick pic, and I knew they would be in my frame. But, I also knew I could clone them out (you know, like a Photoshop wizard!) I set my camera on Bulb mode, 8 secs at f/14 ISO 200, focal length 16mm. Thanks to my Platypod Ultra, I was able to get the shot I was dreaming about with the perfect low angle that draws you straight into The Wizarding World of Harry Potter. Since my camera was on my Platypod the whole time, on the ground securely and I didn't have to move it, I was able to go to my Lightroom library to find a shot that I could use to mask out the security guards. It took me two minutes at the most to mask them out in Photoshop. I then straightened the image, color graded it a little, added contrast, clarity, and warmth to it and even a few fake stars and I was done! This image didn't need much Photoshop since the place is already stunning on its own. In the end, I was able to get the shot I had been envisioning; more importantly, I got to spend a fun-filled day with my son. PS: Make sure to add me on Instagram so you can follow this adventure and more, live, on my Insta stories! Gilmar Smith is an Orlando-based photographer, content creator, Photoshop addict & social media junkie! Visit her at gilmarphotography.com and be sure to follow her on Insta!